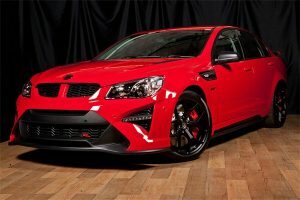 One of the last cars ever produced off the Holden production line in Australia, the GTSR W1, is tipped to get over $300 000 at auction this Saturday. Freeman from Lloyds Classic Car Division says “$300K will set a new record for the newly released W1.” With the end of local production for our Aussie legends Holden and Ford and the continued merging of models across the globe in the name of cost cutting means those of us who appreciated these home-grown hot sedans, utes and the occasional coupe are still mourning the loss of ‘our’ performance cars. Fortunately, there is light at the end of the tunnel with auctioneers, Lloyds Auctions on the Gold Coast, serving up what is probably the last chance we’ll have of buying the best of what Holden and Ford had to offer from the last few decades. Starting at the top of the Holden tree is the mighty GTSR W1 last off the production line with its 6.2-litre LS9 pumping out 474kW of supercharged goodness, making it the quickest locally made car ever. Presenting in immaculate condition this W1 is number 36 of 300 and has only 21km on the clock and comes with an extensive array of W1 memorabilia. On the Ford side is the best and the last of the Falcon line ever produced, a Ford FG XR6 Turbo Sprint. This Falcon is number 86 of 500 and has only 1200km on the clock. “This auction has already sparked a lot of interest because of the extreme rarity of these cars, with most in immaculate condition” Mr. Freeman says.